Each week, as regular readers know, we pose a series of questions to a winemaker. This week, we’re featuring Brooks Painter, the director of winemaking for V. Sattui Winery and Castello di Amorosa, both in Napa Valley. Before joining the Sattui family in 2005, Painter worked at Robert Mondavi Winery, where he worked as the winemaking operations manager for five years. Before that, he was an assistant winemaker at Stag’s Leap Wine Cellars. Raised in northern California, Brooks studied chemistry and biology at UC Santa Cruz. He has been making wine for 30 years. Check out our interview with Brooks below the fold! Castello di Amorosa wines reflect a balance of Old World style and the terroir of California. We source from Napa Valley, Anderson Valley, Carneros, and Santa Barbara County, and our stylistic aim is to produce wines truly representative of the world’s great wines while also reflecting California’s unique climate and growing conditions. We are committed to using traditional approaches to the craft of winegrowing and winemaking, but we also incorporate modern techniques and equipment when it improves quality. Rolando Herrera of Mi Sueno is a good friend, and I have his dry rosé open. It’s made from Malbec and Syrah and it’s unpretentious, fresh, fruity, and dry — a delicious summer wine. Richard Graff, because he pioneered Burgundian-style Chardonnay and Pinot Noir in California. Warren Winiarski, for his meticulous attention to detail in the vineyards. Winemakers in California now have the chops and techniques to match the raw materials. After many years of experience we have the opportunity to dial in the right variety/rootstock, for a specific site and match the winemaking to bring out the best of the inherent flavors. We have acquired the experience to manage techniques to make the wines we want. 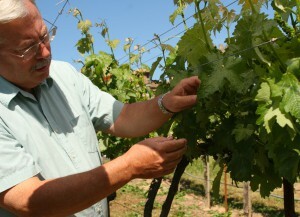 Steve Matthiasson is an example; he is able to blend both viticultural technology with innovative winemaking. Thomas Rivers Brown is another example—he knows how to get the most flavor intensity and balance from the grape. The best would be a 1983 Domaine des Comtes Lafon Perrieres, Meursault Premier Cru, from barrel. The most interesting? A 1920 Cossart Gordon Malmsey Madeira. I would have to check. Raising a family isn’t cheap — I don’t tend to buy really expensive wines because I want to be able to “pop a cork” with friends without worrying about the latest auction price. That said, I do like to collect Bordeaux, Burgundy, German Rieslings and CA reds. The most expensive wine in my cellar must be under $300 per bottle. One of my oldest is a 1998 Robert Mondavi Reserve Cabernet Sauvignon—it was initially considered a lackluster vintage but the wine is aging very well and showing a lot of grace. 1994 Stag’s Leap Wine Cellars Cabernet Sauvignon—my first vintage in Napa Valley. For the red, a 2009 Domaine de la Janasse Cuvee Vieilles Vignes, a Chateauneuf du Pape. For the white, a 2007 Domaine Lafon Le Montrachet. Keeping my eye on the (multiple) balls in the air – remaining focused and coaxing the best harmony and flavor from the grapes. Quality beer has a place just like wine. Sometimes — depending on food, locale or temperature and season — I will prefer a “cleansing beer” to wine. I love to sail and free dive for abalone. At this point in my life I feel I have been very fortunate. What are most important to me now is strong and stable family relationships, good friends and good health. Professional success is very important, of course, and that is what allows the first few on the list to succeed. My wines are liked by many. I consider that success.